Dedicated to make connection between digital contents and game related industry in Taiwan, TGS builds an amazing matchmaking platform in Asia Pacific, allowing global buyers to find products they’re interested in more easily. This January, B2B Zone attracted nearly 2,500 global buyers from 29 countries and matched more than 3,000 meetings. As a result, we’re proud to announce that B2B Zone will move to Taipei World Trade Center Hall 3 next year in order to accommodate more buyers and exhibitors. Please come and join us in 2019TGS! Electricity per booth: 0.5kw (110V). TGS Official website banner, TGS Official social media posts and company introduction in the B2B guidebook. The Organizer reserves the right to change the floor plan, and the floor plan will be announced at the Pre- Exhibition Briefing. 1.The Sponsorship packages are limited. If 2 different sponsors complete the same package application at the same time, the Organizer will draw lots to decide the order. 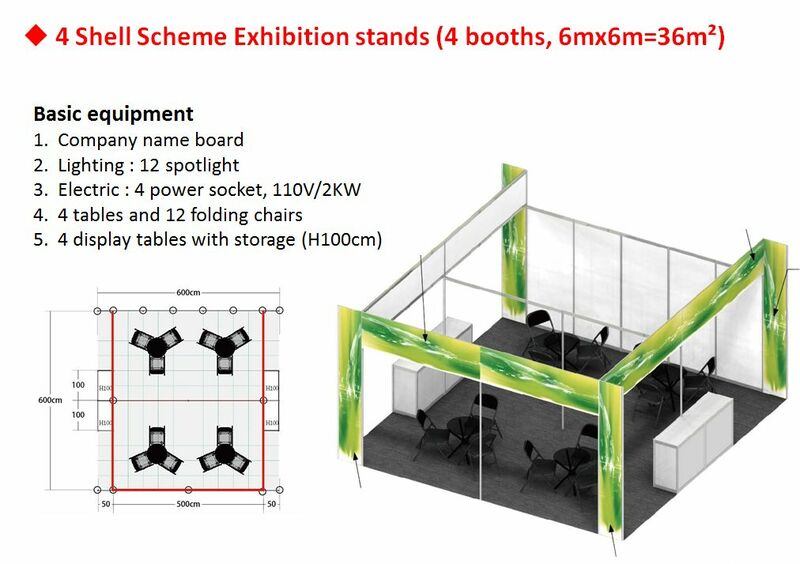 2.These packages above include 1 Shell Scheme Exhibition Stand. Please inform us if you need more booths. The Sponsorship packages are limited. If 2 sponsors complete the same package application at the same time, the Organizer will draw lots to decide the order. 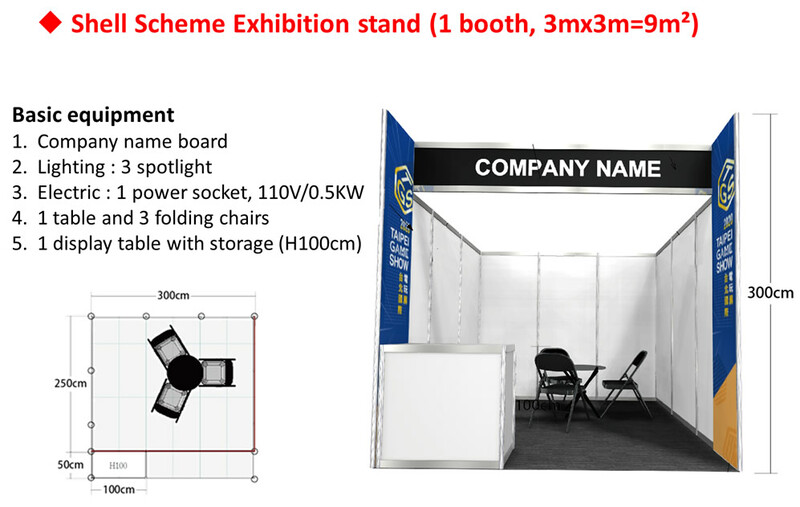 Organizer will make the company name board, which includes company name, country and booth number. It is not allowed to cover the green-marked area by any artworks. Admission to B2B Zone is limited to those who work in the game business and press who will report on Taipei Game Show. Those who do not work in game industry (NOT working for game-related companies, game-related jobs or distribution of games), those who are less than 18 years of age or those who are students will not be allowed to enter B2B Zone. If you need more booths after completing the registration, please contact the Organizer and you will receive the revised application form and invoice. The registration will be completed as soon as the Organizer receives both signed application form and full amount payment. If 2 applicants complete the registration at the same time, the Organizer will draw lots to determine the order. We kindly suggested that exhibitors take out insurance on asset and burglary during the exhibition period (inclusive of set-up and move-out time). Damage, theft, and burglary occurred during the exhibition are at exhibitor’s own risk. Resales or booth transfer is forbidden , the Organizer reserves the right to cancel such exhibiting. Depending on the sponsorship level, booth numbers, and the date of registration, the Organizer will determine the booth allocation. TAIPEI GAME SHOW reserves the right to change the floor plan. Once the application is completed, no cancellation allowed. The paid fees will not be refunded and will be used in the promotional activities of TGS. If unpredictable circumstance results in cancellation of the B2B Zone, the Organizer reserves the rights to cancel, terminate, amend the content and stop this activity.